Classrooms transforming across Rwanda — Educate! | Preparing youth in Africa with the skills to succeed in today’s economy. Skills Labs, Educate!’s innovative teaching model that puts students at the center of their own learning and promotes the practical application of skills, are a feature of Rwanda’s new competence-based curriculum (CBC) in the entrepreneurship subject. The format allows teachers to disrupt the all too common practice of lecture-based learning by inviting students to participate in their own discoveries. Borrowing from the term ‘science labs’, Skills Lab is the experiential education pedagogy aspect of the entrepreneurship CBC (i.e. the way we teach students by doing). But when the CBC was introduced to her district, Agnes hadn’t been trained on Skills Labs and therefore couldn’t support her teachers in its delivery. 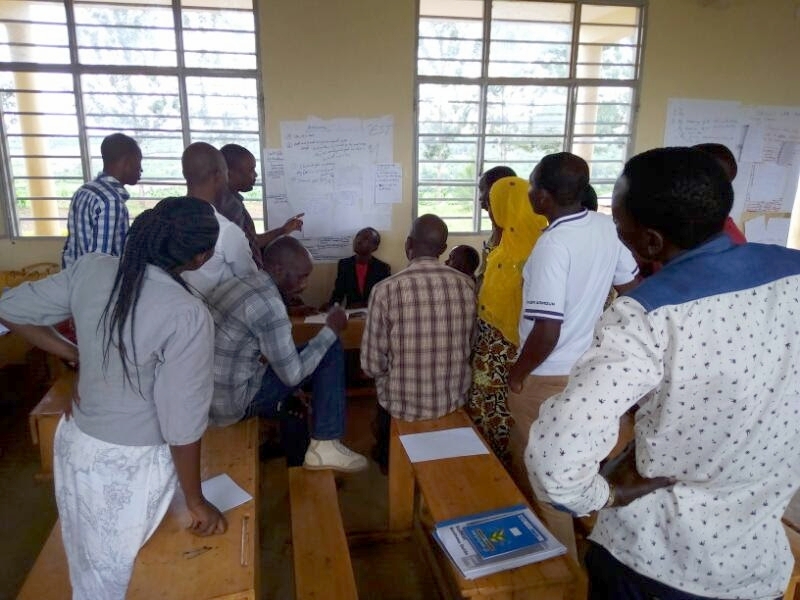 If Deans of Students, the district level instructional leads in Rwanda, are trained on Skills Labs, then they can best support their entrepreneurship teachers and students will thrive. On June 9th, Educate! and Akazi Kanoze Access (Rwanda’s experts in workforce readiness and Educate!’s implementation partners) invited Deans of Students to Muhanga for a training, our biggest of the year, where they learned about new entrepreneurship syllabus components, such as Skills Labs, and created action steps to support their teachers in the reform. It was at this training that we met Agnes and she reflected on her experience with Skills Labs: She originally saw Skills Lab as something only for Educate!’s Youth Leader, Brenda, and the entrepreneurship teacher. She didn't know that they were part of the new CBC. Over time, she realized "[Skills Labs] are mine. Not just for Brenda or teachers or AKA or REB [Rwanda Education Board], it's mine." When her school GS Rango, hosted a Mock Day, a day for teachers to practice delivering Skills Labs, what Agnes saw inspired her to pull the school’s Head Teacher into the classroom so he could see for himself. The impact was remarkable. He came to her so enthusiastic and encouraged. He said that every subject should be taught like a Skills Lab! The importance was clear, this teaching methodology would transform the classroom and allow "learners to learn for themselves," not just by note taking and memorization, but by doing, exploring, and discovering. Agnes was a true CBC champion at her school. Now her and the Head Teacher have a vision, to have the experienced entrepreneur teachers demonstrate a Skills Lab for all of the school's teachers to see. They want all subjects to be taught in the Skills Lab format. Agnes and her Head Teacher believe this could positively change the way their students engage in learning.